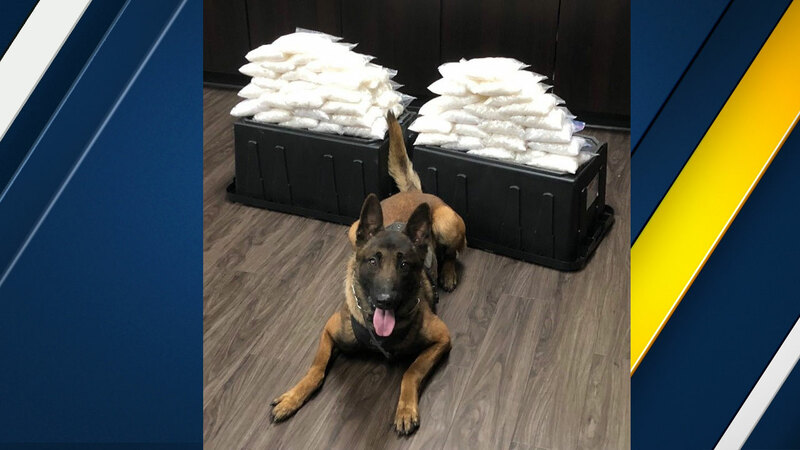 WEST COVINA, Calif (KABC) -- The West Covina Police Department's newest K-9 helped authorities find 60 pounds of methamphetamine inside a vehicle during a traffic stop. Authorities said around 7:20 p.m. Saturday, a traffic stop was conducted for the driver of a silver 2010 Nissan Rogue for vehicle code violations. It happened near Vincent Avenue and the 10 Freeway. During the stop, methamphetamine was found under the driver's seat. Authorities detained the driver and a narcotics detection K-9 was brought to the scene. That dog, named Rye, detected more drugs in the vehicle. Authorities impounded it and found more methamphetamine hidden in two compartments - one under the driver's seat and another under the front passenger's seat. The suspect was identified as 28-year-old Pedro Lopez, of Paramount. He was arrested and booked on suspicion of methamphetamine for sale and transporting narcotics in a hidden compartment. He is held on $1 million bail. The total amount of meth found was 60 pounds, according to authorities. Rye is the department's newest K-9, who was field certified in narcotics detection in April. This was his first detection since being certified, the department said.